I know I have written this before, but I love team sports. It’s one thing to run in circle to see how long it takes to get back where you started. or accepting the winning trophy because you hit the little ball into the hole in a smaller amount of strokes, but organizing a group to act and perform as one is an achievement. Strong societies are built on collective achievements, something that seems to have escaped many today. Yes, we look for heroes to carry the day, but truly great things are done by teams today. Team playing in governing, scientific accomplishment by building on research of others, and winning wars working together are examples of team effort today. 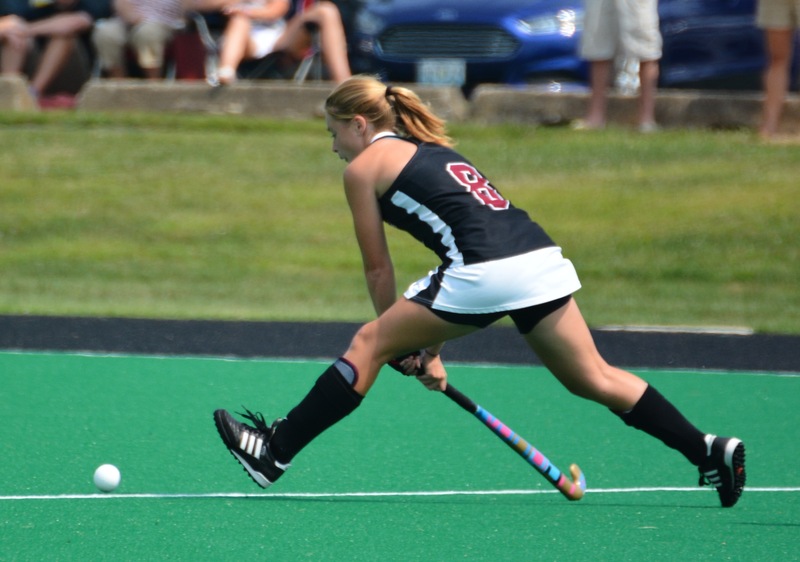 Katie Birle chases down a ball as a Temple player is in hot pursuit. 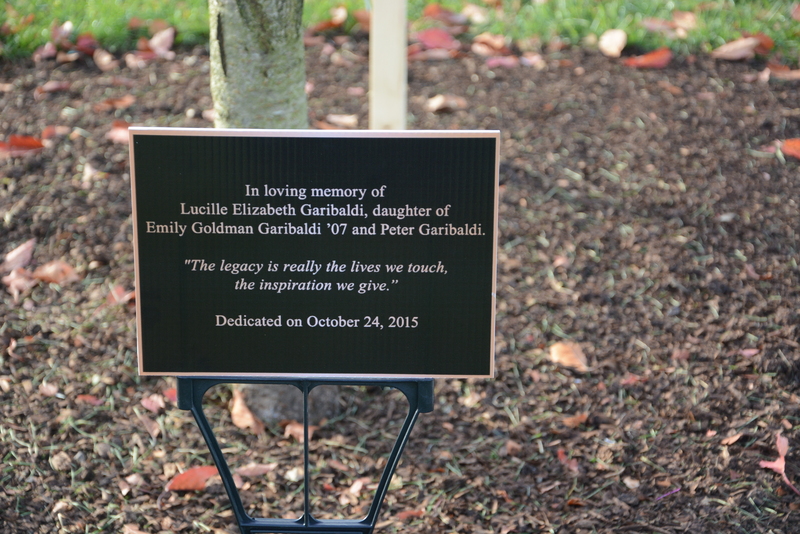 Saturday we dedicated a tree in memory of a recent alumna whose little two year old died of leukemia. All her teammates were there to support her. One friend even gave her daughter a middle name after the little girl! This is what team is all about. You care for each other, you trust one another, you believe in common goals, and that never goes away. Next Sunday we will celebrate Senior Day as they will play their last regular season game together. Hopefully after playing Colgate the day before they will come together and perhaps again qualify for the League Tournament. It will happen because they were a team and were not running circles to see how fast they can end up at the same spot they started from. (No offense to our track athletes). If we win its because we care for one another ( enough to put in the extra effort to help each other out), that will engender trust to know your teammate will be there when you see a space, and you believe and want that common goal, not for yourself but for your team. Go Leopards! I have been writing this blog on this format and for a newspaper for years. 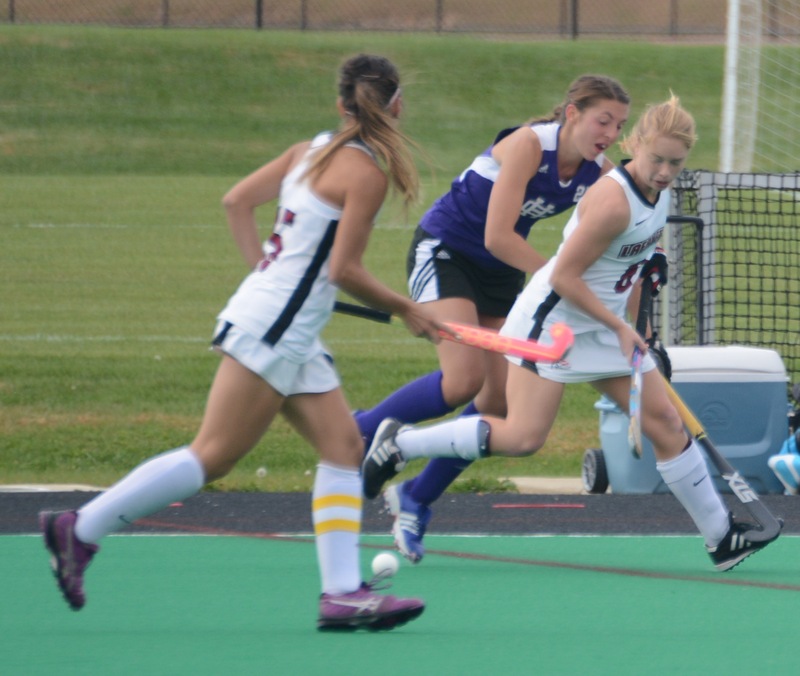 I have also been an observer of college division one field hockey for 25 years, and yesterday I observed something I have never seen in the hundreds of games I have attended, including games ranging all levels of skill. At 58:30 into this important game an official called her first card of the day of a generally well played match. It was a yellow card against Hannah Millen, Lafayette’s key defender and captain. OK, stuff happens, and the card was a judgment call. But then we found out she had assigned her a 10 minute penalty! Meanwhile Millen would not return until 1;30 was left, which she did, and scored on a penalty stroke. However, in the meantime Holy Cross was to score using the extra player advantage which they had for almost the remainder of the final period. I would assume a ten minute card would be reserved for the most egregious foul, with perhaps a player on the ground. Not so, as you will see in the enclosed video. You make the call. Games are better played when officials do not become part of the outcome. In this case this official became a factor in the eventual result. Not good, especially at this level. It was the first yellow of the game and only second card of the entire game which included a green for Holy Cross. I don’t want to take anything from Holy Cross who played an inspired second half scoring 3 goals to win and stay in the hunt for a playoff spot, but there are 22 contestants on the field and it should be decided there. Lafayette started off strong scoring after only seconds were run off the clock in the first period on a corner with a Magadan strike via a Turner to Millen assist. 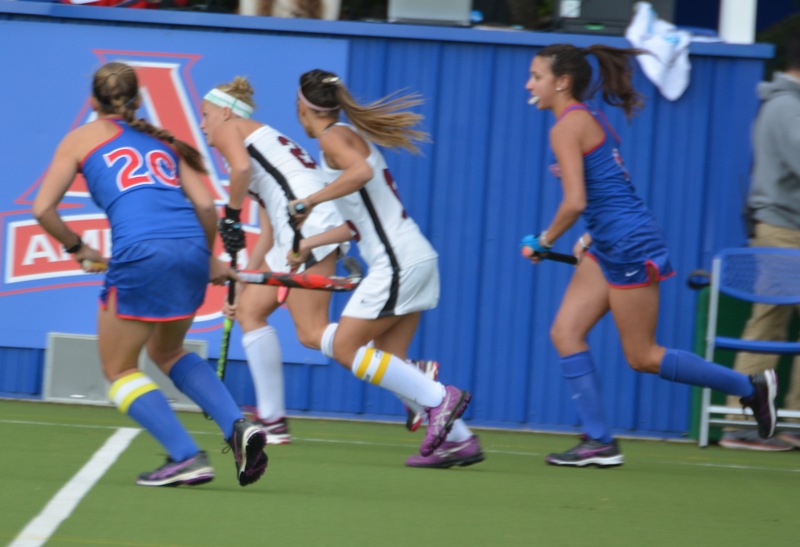 Things looked good for the Leopards as they used the speed of Ellen Coulbourne and Kendall Weedling to advance the ball upfield into scoring position . 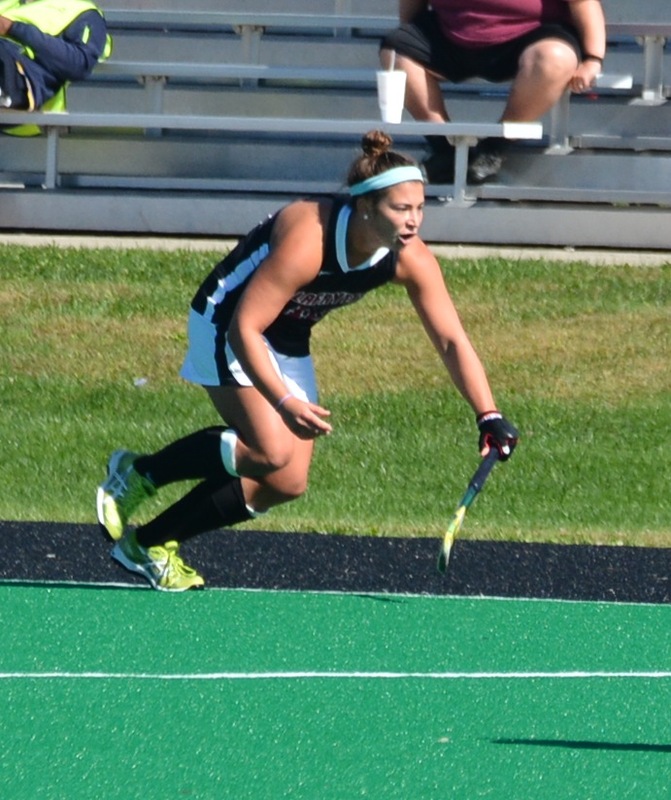 However, Lafayette had several scoring chances thwarted by Inch, the Holy Cross goalie. 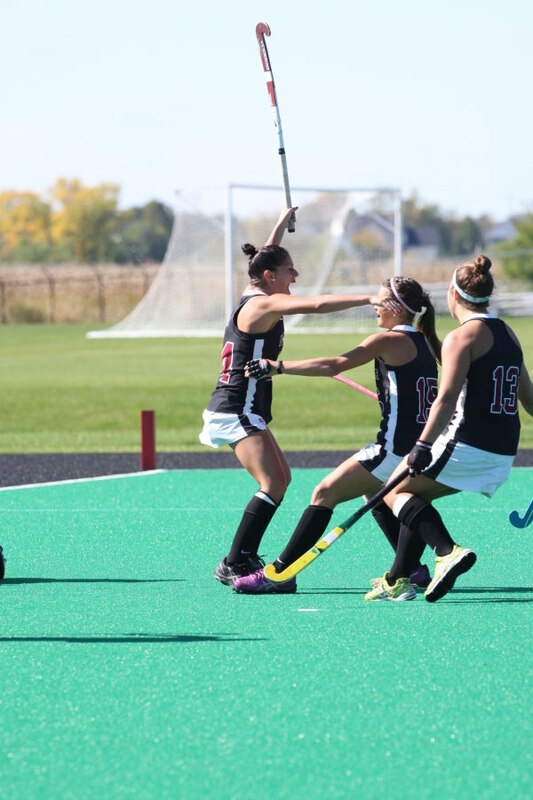 The second half saw Colbourne double and triple teamed as the Crusaders during halftime planned to take away the Leopards speedy weapon. Having only gotten 4 corners in the first half Holy Cross managed to get 10 corners in the second and at one time 4 corners succeeding in a row were called against the Leopards. The Crusaders were tenacious guarding Lafayette closely and taking advantage of opportunities. Mauren Conolly was active scoring two goals in the second period while Michelle McNeil was to get the go ahead goal on a corner at 55:51. The all important insurance goal was made at 59:58 after the 10 minute yellow. The game ended on Millen’s goal on a stroke called with five seconds remaining highlighting the importance of that insurance goal assuring there would be no overtime. So you got all that. To the players. just win and what will be will be. And I have become an American fan against Bucknell just for next week!! 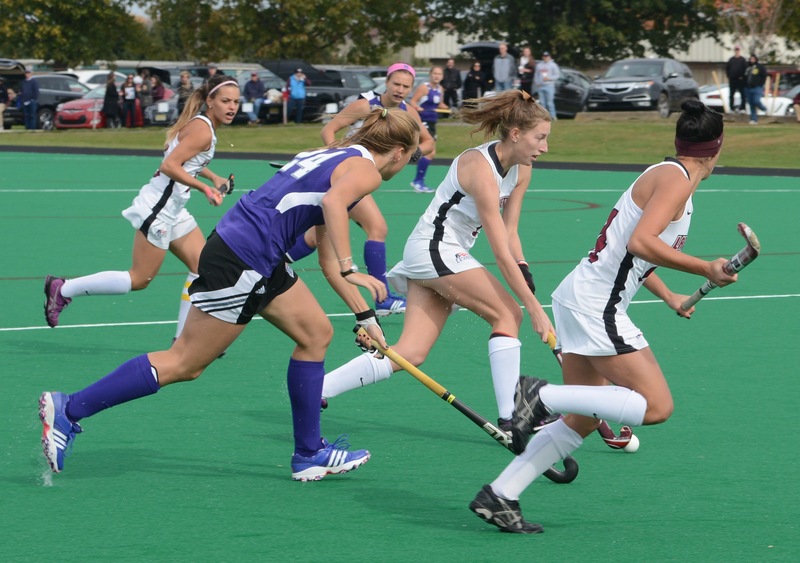 Leopards Have Key Game This Weekend With The Holy Cross Crusaders. The Leopards will meet the Crusaders for the 32nd meeting between these schools. Lafayette has an edge with 18 wins against thirteen loses. The last win by Holy Cross was a 2-1 OT win in Easton in 2009. 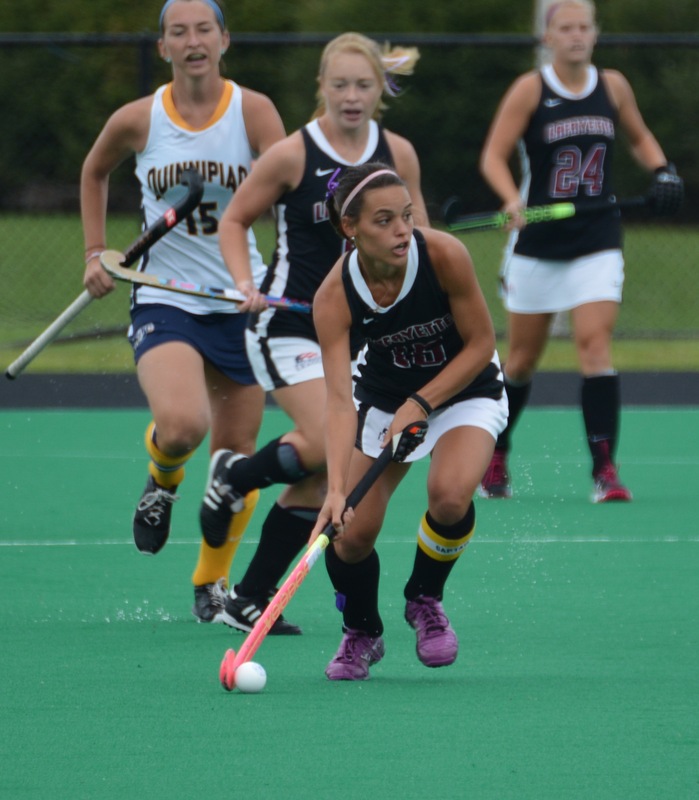 In that game, the Leopards had 26 shots to 3 for Holy Cross. The Crusader goalie had 12 saves in that encounter, but Lafayette scored the first goal in the first period and looked like they were on their way to a win when, with 6 minutes left to play, Holy Cross found the back of the cage to tie it up. The Leopards had chances in the end. including two corners, and the game ended in a tie. Two overtimes later. 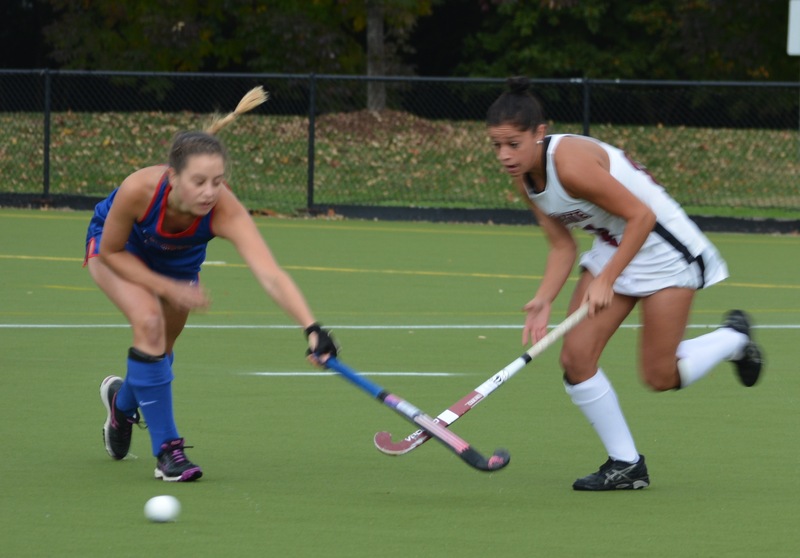 it came down to strokes and the Leopards ended on the short end losing 2-1. The Crusaders had a losing season and put the Leopards in a difficult spot regarding the playoffs. This Crusader team is a better team coming in with a 6-9 record but having lost the last 6 out of 7 games. Their goalie, Inch is a key player and the Leopards must find their way to the circle to exercise their 24 pct scoring percentage. Holy Cross is 19 pct but take more shots and get more penalty corners than the Leopards have. Outside of Boston University I see no ranked team on their schedule but have posted a good win against Harvard early on. This is the part of the season where individual games matter. In order to get to the post season, these league games must end up in the W column. The Leopard’s fate is in their hands. They win, they are in the post season, if they lose its too complicated for my 70 year old brain to calculate but it is clear it will depend on other teams to make it all possible. Twelve o’clock it all happens. The sky’s will be clear and a brisk fall afternoon is anticipated. Here’s hoping it ends in Maroon happiness!!! Come on out and enjoy the action. 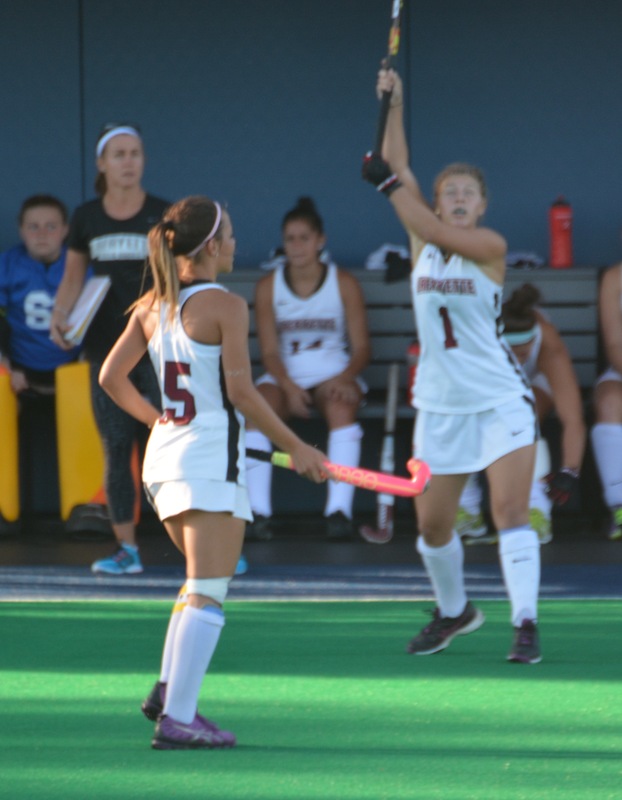 Posted on October 23, 2015 October 23, 2015 Categories SportsTags field hockey, Lafayette CollegeLeave a comment on Leopards Have Key Game This Weekend With The Holy Cross Crusaders. Is It Too Early For Patriot League Bracketology? The Permuations At This Moment. We are getting to that time of year where each game takes on added significance, and we start to see who has a shot at getting to the National Tournament to pick the best in the nation. The Patriot League, based on last years RPI will get an automatic bid to NCAA tournament. The honor goes the Patriot League tournament winner. There are seven teams in the League, and the four with the best record and, surviving tie breakers will play a four team two day tournament, the winner to move onto the big dance. The are two things now for certain, Boston University is definitely in and Colgate is out, based on Boston’s 4-0 record and Colgate’s 0-4 record in the league. So if you believe that Boston has locked in the home field, think again. If Bucknell runs the table, the first tie breaker is head to head competition. Bucknell would win the regular season and host. If Bucknell losses one of their three games they will not host but would make it in. If Lafayette ran the table and Boston lost one, Lafayette loses the tie breaker and could not host. Boston would have to lose to Lehigh and Bucknell and Lafayette would need to run the table for the Leopards to host. To lock in their place in the tournament all Lafayette needs to do is win two of the last three. Bucknell will have two tough final games against American and Boston. Winning both would be remarkable. Holy Cross needs to continue to win. Should they lose to either Bucknell or Lafayette, they are probably out. Lehigh plays Boston this weekend and even if they run the table are unlikely to make it in having lost to Bucknell and Lafayette. Colgate has no way in but could act as a spoiler to Lafayette should Lafayette lose to Holy Cross and American. Will Bucknell win against an improved and inspired Holy Cross team, helping the Leopards out?? We haven’t even talked about seeds…maybe next week!!?? So this weekend’s games will be closely watched and in all likelihood the field will be narrowed by the end of day. Interesting question is on the table for this weekend. What upset will spoil everyone’s calculations! 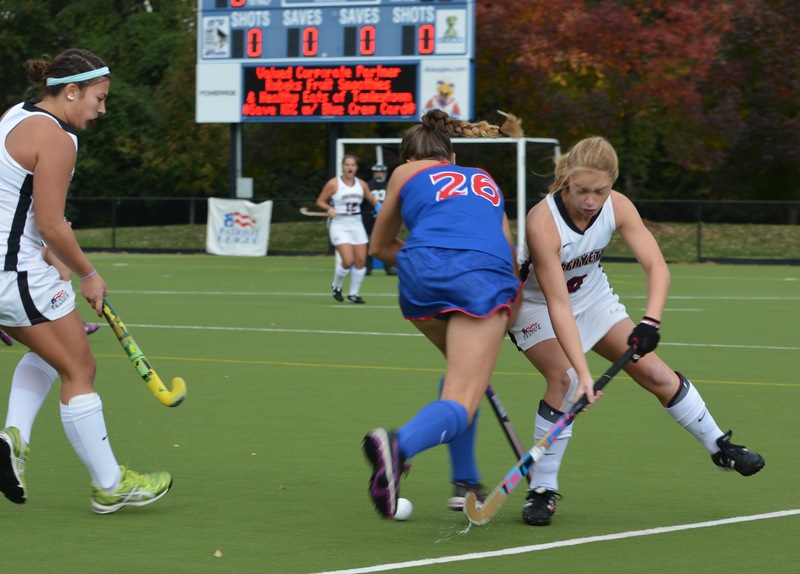 Posted on October 13, 2015 October 13, 2015 Categories SportsTags field hockey, Lafayette CollegeLeave a comment on Is It Too Early For Patriot League Bracketology? The Permuations At This Moment. In most sports accounts, the writer concentrates on the player who scores the touchdown, goal, or makes some spectacular play and I will give credit to all those I mentioned in the title. But I also want to especially emphasize the final member of the team, Et Alia. Don’t go rushing to the roster list, or the final account of game on goleopards.com because Et Alia will not be mentioned. Et Alia is a latin phrase that appears often in legal text as the abbreviation et al, meaning everyone else. This game was won by Et Alia, the entire team. It is no secret, that the entire team was in a slump. After tuesday’s game against Penn there was depression settling over Pardsville. The Leopards looked out of sync, and out of sorts. Et Alia was not to be found. But something changed in the last four days. The team that arrived on the field on Saturday for this important league game was not going to be denied. Bucknell arrived with impressive history having won the Patriot League regular season and not losing a league regular season game in two years. In fact, they had beaten the Leopards each of those years. But these games with Lafayette were always close and well fought. I have to admit I arrived at the field this year with some trepidation. A repeat of last tuesday would mean certain defeat and a struggle to make the playoffs. 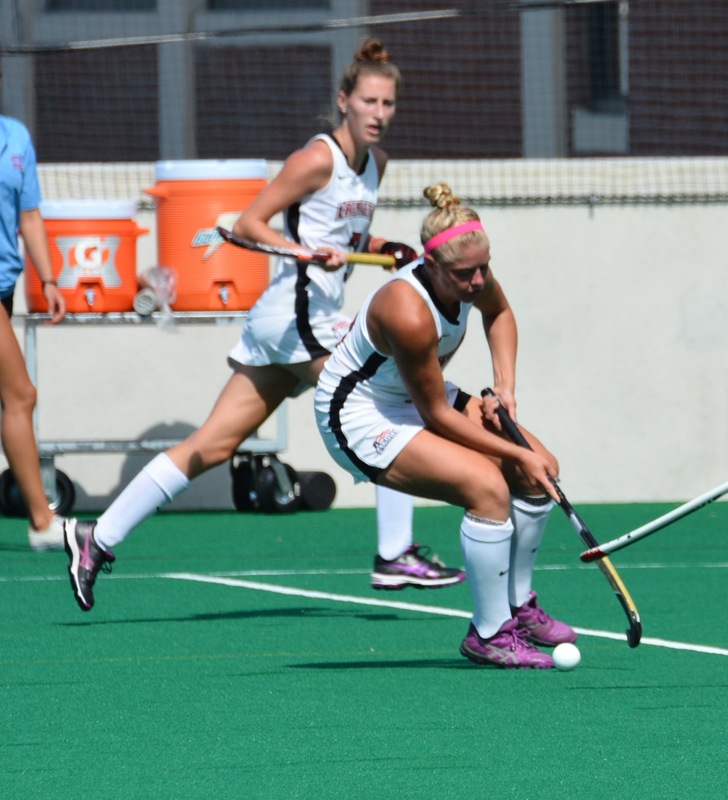 The Leopards took advantage of opportunities, and as we know pressing constantly, takes some sacrifice in energy and defensive coverage downfield and the Leopards took advantage. 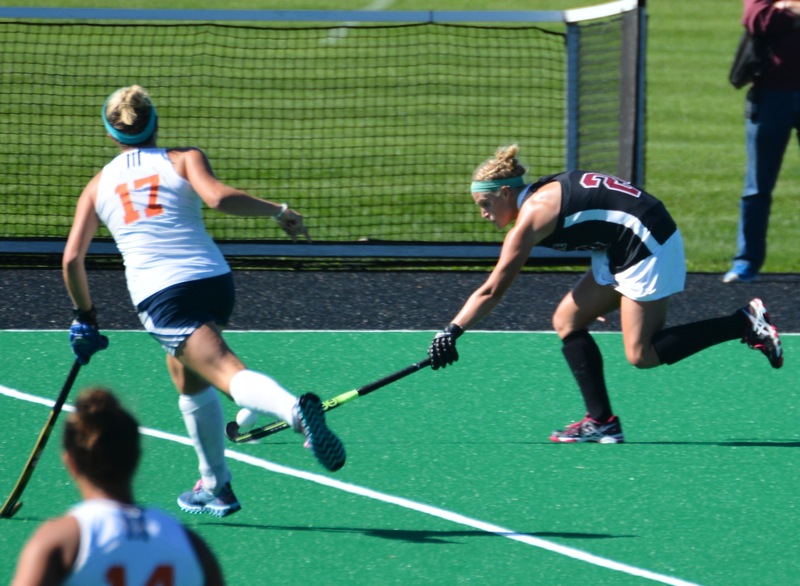 Yes, Bucknell had a 17-8 advantage in shots, and a 10-4 advantage in corners. But as some sports sage said long ago statistics are for losers. Lafayette on this day used a team effort which included the efforts of Arnold, Macrae, Weeding, and Shanks who helped put points on the board and stopped goals when needed. First Arnold came with save after save. Some were ordinary kick saves but there were others of the leaping variety. I believe Katelyn Arnold is the best goalie in the League and she proved that to the crowd and her opponents. Scoring started early with a Kendall Weedling goal delivered off an alert pass from Paige Macrae who had an outstanding afternoon. 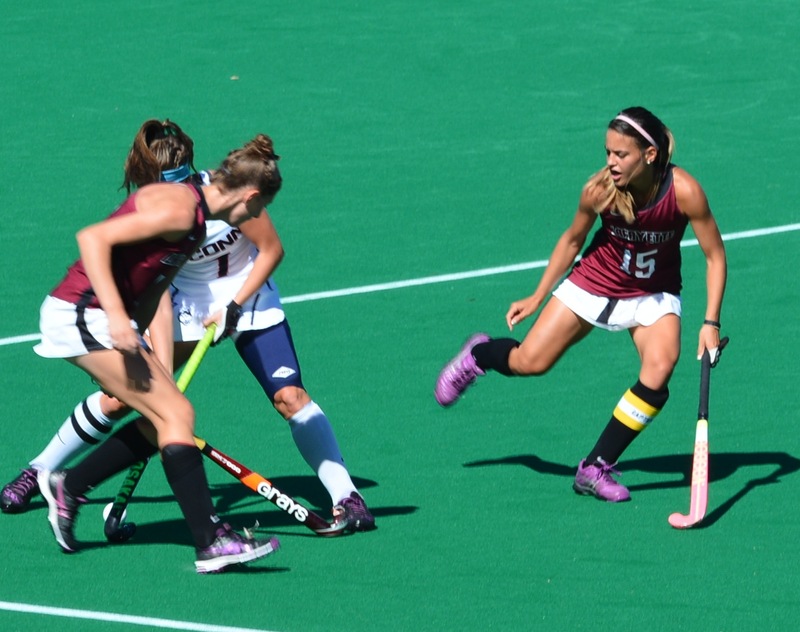 The two were able to take advantage of a fast break and took on the Bucknell goalkeeper two on one with Weeding deftly delivering the shot from goalie’s right side. 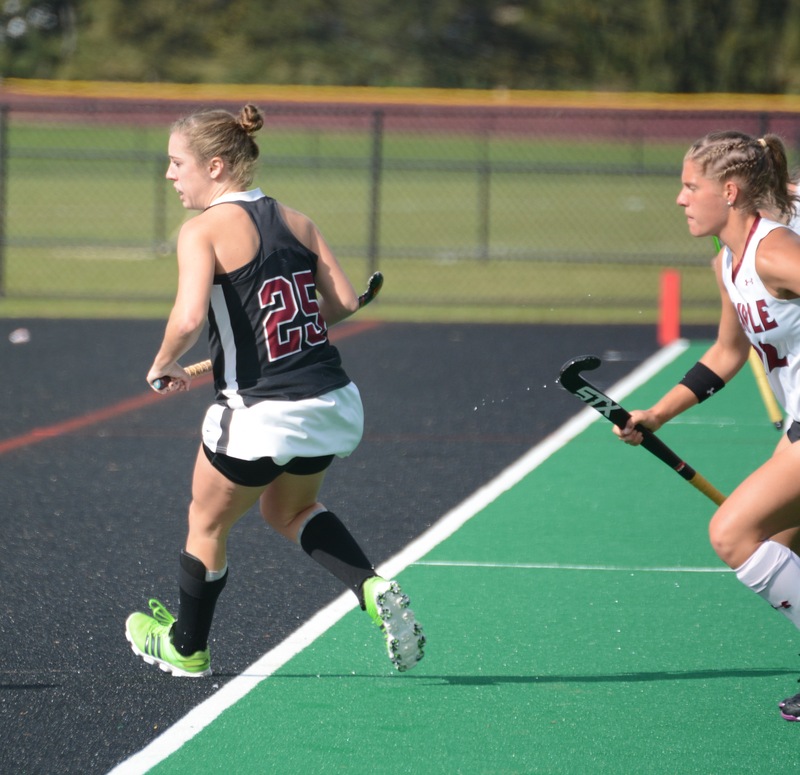 The second goal was nearly 41 minutes later from sophomore Rosie Shanks who also executed a break, after a steal by Hannah Millen who passed to Macrae. 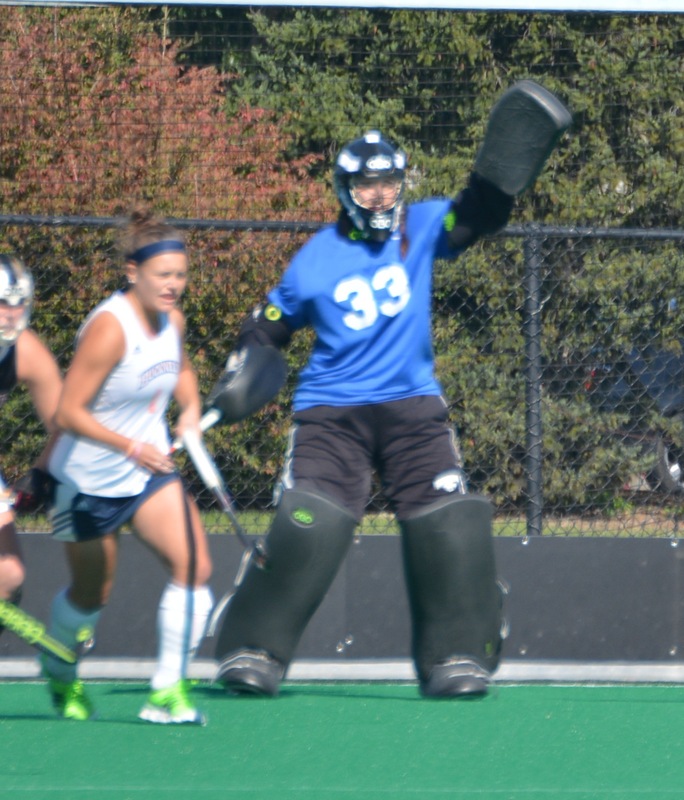 The Bison were executing a break of their own when the Millen to Macrae pass to Shanks found her near the top of the circle facing the Bison goalie who had come out of the cage. Weedling meanwhile came speeding up the other side of the circle and Shanks shifted her focus to Weedling creating the hesitation needed in the Bison goalie, to allow a clean shot at the goal. It was a rocket that sounded with smack that was heard throughout the field. Macrae was to get a goal of her own during a penalty corner as Amanda Magadan received the ball at the top of the circle delivered a pass to the reliable Paige Macrae who deflected the ball soundly into the cage for her third goal of the year. Bucknell was still to be heard from as Nicole Rupnick received a pass from Amy Mucelli and shot at 66:40 of the game into the goal. 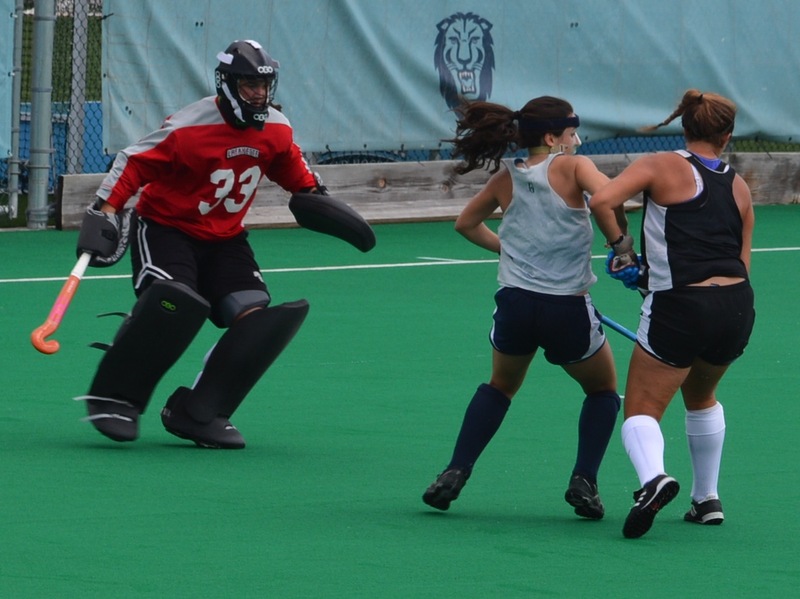 The game was to end, as time ran out on a Bucknell corner which was stopped by a defensive save by Hannah Millen. Although it was meaningless toward the final outcome, it was a metaphor for the whole game. 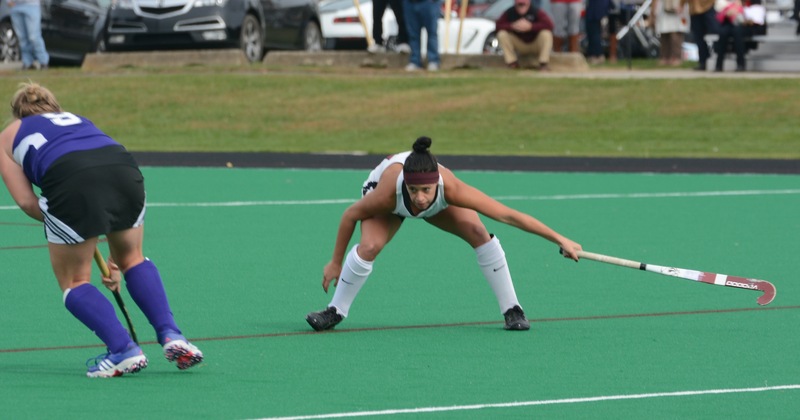 Bucknell battled to the end but Lafayette was not to be denied today by “et alia”,….. the team. The Leopards are now 2-1 in the league and will meet 3 other league members in coming weeks, American this coming Saturday, the much improved Holy Cross Crusaders, and finally Colgate who eliminated Lafayette last year from the playoff. 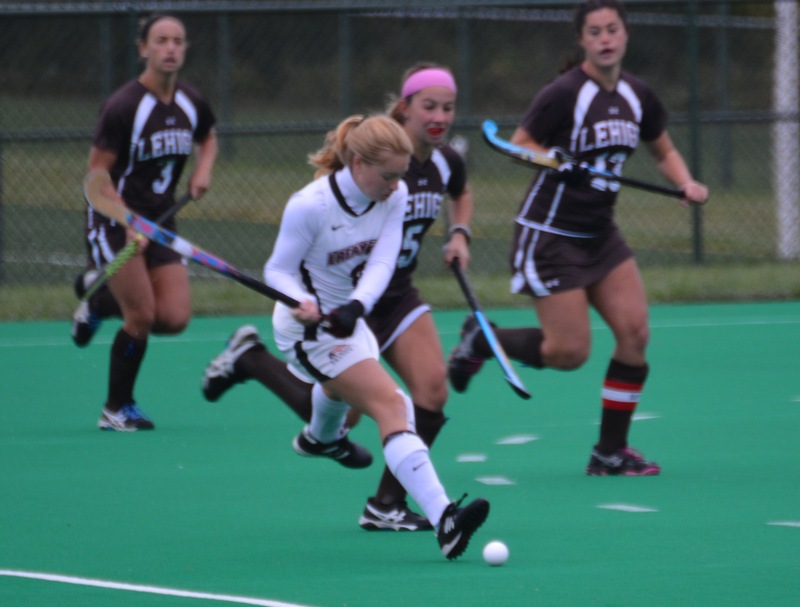 Lehigh with 4 loses has already been eliminated, and Boston University has clinched a berth with four wins. 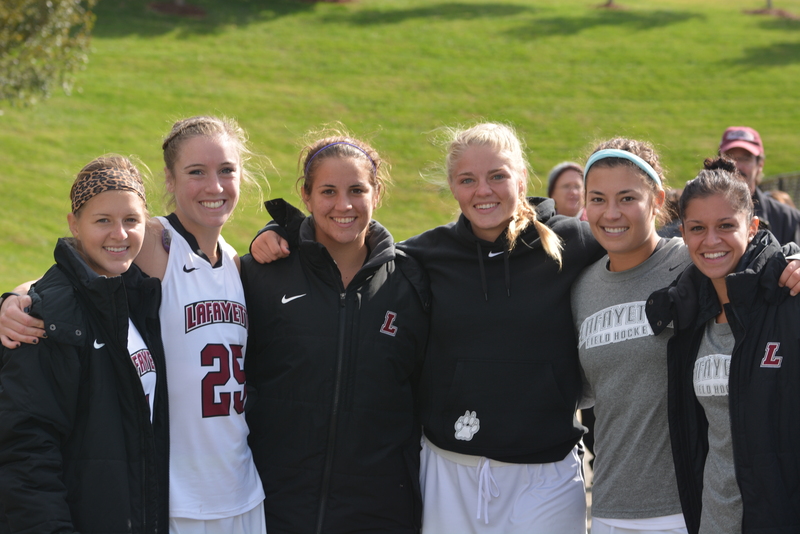 The Leopards also welcomed back assistant coach Joey Civico who returned to the sidelines. However, Bucknell will bring a well coached and motivated team to Easton. There are common opponents. They beat Monmouth 2-1, lost to Albany 3-1, and beat Lehigh 4-2. Sound familiar? With the exception of the home field win over Lehigh the other two scores are exactly the same. Which team will arrive with the most desire to win on Saturday? Lafayette fans hope it is not the one that faced Penn, but the Lafayette team that has the talent to beat a tough league rival, Bucknell. Go Pards! !